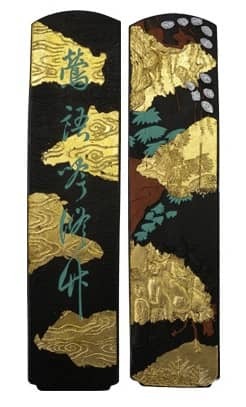 This Japanese luxury ink stick from Suzuka is made for calligraphy master pieces. The paintings on the ink stick are very rich and beautiful. When using this ink stick the gold pigments dissolve in the ink and leave golden sprinkles on the calligraphy. Shinseido has been established in 1947 and nowadays is run by the 3rd and 4th generation of the Ito family. It is one of 5 remaining makers of Japanese Ink in Suzuka - a city not only famous for the F1 circuit but also a center of production of traditional ink sticks. Shinseido has been recognized as a traditional producer of ink craft by the Japanese government.